I am working on my Best of 2011 this week and next and it will be published, as usual, before the end of the year. This brought many random thoughts to mind that I will share now, instead of in that post. First of all, as I constantly mention, I don't have time for this blog. I am complaining in a way, but I shouldn't be, because in reality I don't make time for this blog. It is fun, and a hobby, but not a priority. I am a husband, father, and I coach and teach teenagers, and all of those relationships are far more important than this. And I am not even really writing this blog for you, the reader, I am doing it for myself. Maybe shouldn't admit that, but it is true. It is my personal music journal that I am sharing with the world in the hope that you will enjoy the music I discuss, it will inspire you, maybe even spiritually impact you, and then you will buy it from the artists so that they will continue to write and record it. Next thought, about the internet and social media. If you are reading this it means I just published this blog entry and linked it to my Twitter and Facebook accounts. I was discussing with my wife recently (who barely touches Facebook and doesn't have a Twitter account) about how people must think I am pretty shallow because all I ever talk about in social media is music and sports. Well, that is why I use social media. Yes, I use it to interact with friends; but to talk to my friends about music and sports. Are music and sports the most important things in my life? Of course not. But the things that are most important to me I don't talk about on social media. For example: my Dad has developed some pretty amazing online Bible study materials. I like them, but I don't use them, because when I spend time with Jesus I have to get away from the computer. I sit somewhere away from all technology, open the Bible, and hopefully have a good view of nature. All that to say is if you only know the online me, you don't really know me. And so when I am spending time with my family or my God I am not tweeting about what is happening. Finally, about buying music. Just do it. It is SO easy to listen to tons of music and never buy it, or pay the smallest amount possible. 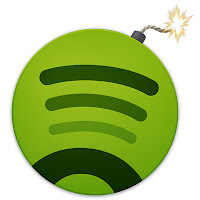 Take Spotify for example; it is a very cheap service in which you can listen to just about any music you want legally. I have had many conversations about it recently online and face-to-face. If you are using Spotify to listen to music you already own, or to discover new stuff, fine. But make sure you are still buying music. Derek Webb recently said that he would rather you steal his music than listen to it on Spotify. And many artists are pulling their music off Spotify because they amount of money they make when you use that service is so little it might as well be nothing. I (and you, if you read this blog) listen to tons of music by artists who are not career musicians. That means if you don't buy their music they won't keep recording. Worst case scenario is that your favorite band will break up before they record their best album because so many people illegally downloaded their last album and they can't afford to continue. I have a pretty tight music budget, but I feel it is extremely important to continue to purchase music because I want the artists I like to continue to make music for as long as possible. How should you buy it? 1. Go see the band in concert and buy a vinyl record or CD directly from them. 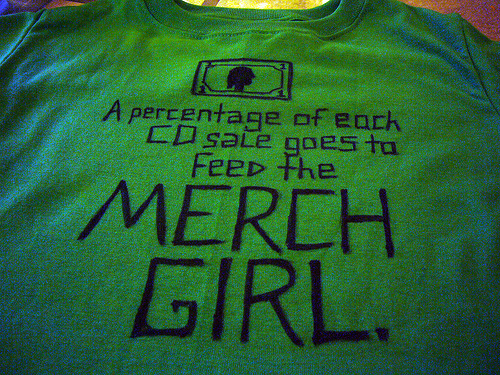 Visit the merch table; they make the highest percentage of profit this way. 2. Buy a physical form of music from their website or their label's; they make almost as much as at the concert. 3. Buy it digitally from their website or from BandCamp; that way there is no larger corporation getting a high percentage of the profits. 4. Buy a physical product from Amazon. I mention Amazon specifically because it by far the cheapest way to get music legally. Plus they have fast, free shipping (most of the time). 5. Buy digital music from Amazon (far cheaper than iTunes). Now, back to my music budget. Unfortunately at my stage in life I only get to one or two concerts a year, so option #1 is rarely possible for me. I use option #2 frequently, but sometimes I can't afford it. For example, when the new Thrice album was released earlier this year they were selling it through the vinyl through own online store for about $38 including shipping. I made the decision to buy it from Amazon for $19 including shipping. Be prepared to spend a few extra bucks for the artist online store, but a 50% mark-up is way too much. If it had been $23 on Thrice's website, I would have paid them and not Amazon. (And now as far as I can tell it is out of print, and is going for $70!). Lastly, about Amazon. If you are looking for the cheapest prices for digital music, CD's or vinyl records, it is all about when you buy them. For example, digital albums can range on Amazon from anywhere between $2.99 and $11.99 for the same album, just at different times of the year. Over $8.99 is very rare, but just about every single digital album will be $5 or less at some point, you just have to pay attention. As far as vinyl records, to get the cheapest price you must pre-order. If you pre-order at any point you are guaranteed the lowest price, and as I did research for this blog post I noticed that all the vinyl records are now on average $5 more than they were when I bought them. Typically most vinyl records are $16 for a pre-order, and $21 a few months after the album has come out. As the popularity of vinyl has increased, unfortunately so has the cost. I am not sure exactly why this is, except I would say higher-weight vinyl is the norm now and the packaging and artwork are more elaborate (which is worth the price increase). Sorry for the rant, the next post will be far more interesting.